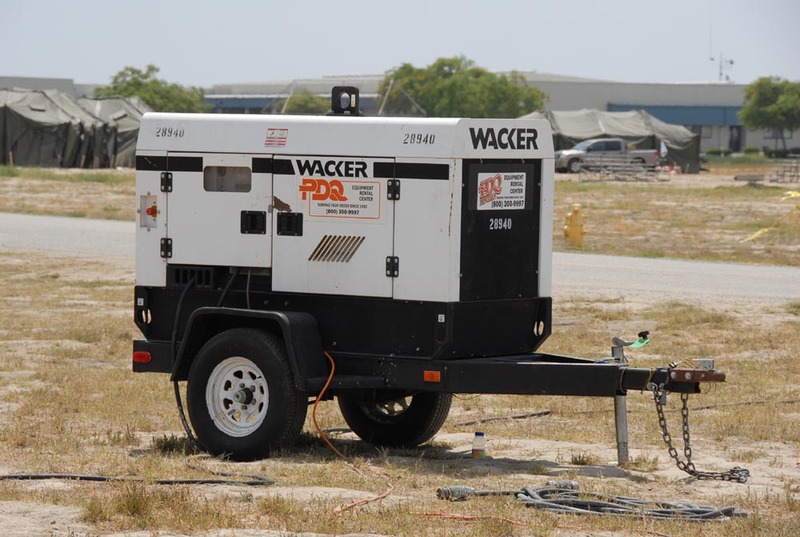 Here is the 40KW super quiet commercial generator we used during FD. The best endorsement for a generator is not knowing it is even there. 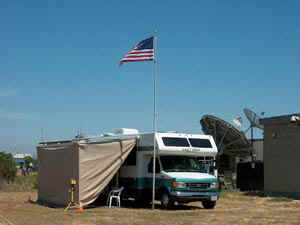 Did anyone notice that the commercial power for the entire base went out early Sunday morning? 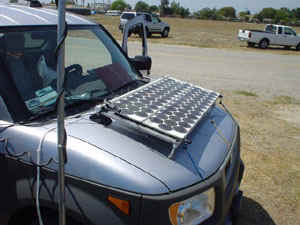 The FD operators just kept operating and probably never knew that happened. Hams who are also members from the local Huntington Beach RACES set-up solar-power capabilities. 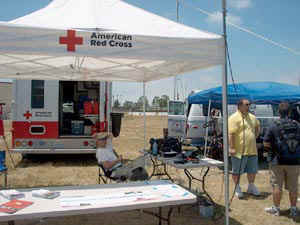 The Disaster Services branch of the Red Cross set up a shady spot with information brochures about the Red Cross. 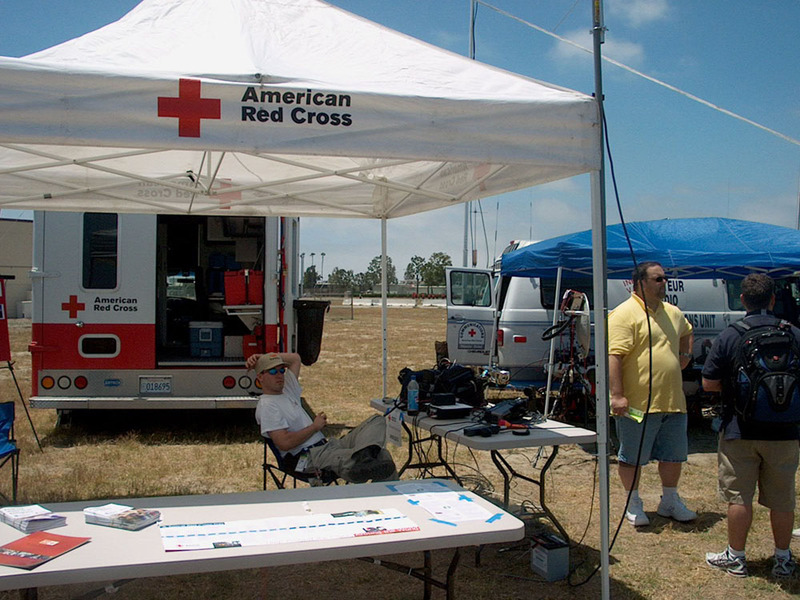 Tom Woodard-KI6GOA., an employee of Red Cross, has a 2M station set up in a nice cool brezzy spot. Our visitor from Japan, Katsutoshi-JK1PHL/AF6CQ, is also a member of the Japanese Red Cross and he and Tom spent time comparing notes during FD. This was the "Information-Hospitality" tent that the club set up. 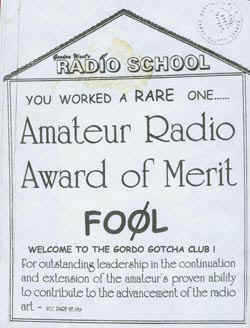 It contained handouts about Ham Radio, the OCARC, and Field Day. It also contained huge ice chests of bottled water and Gatoraide. 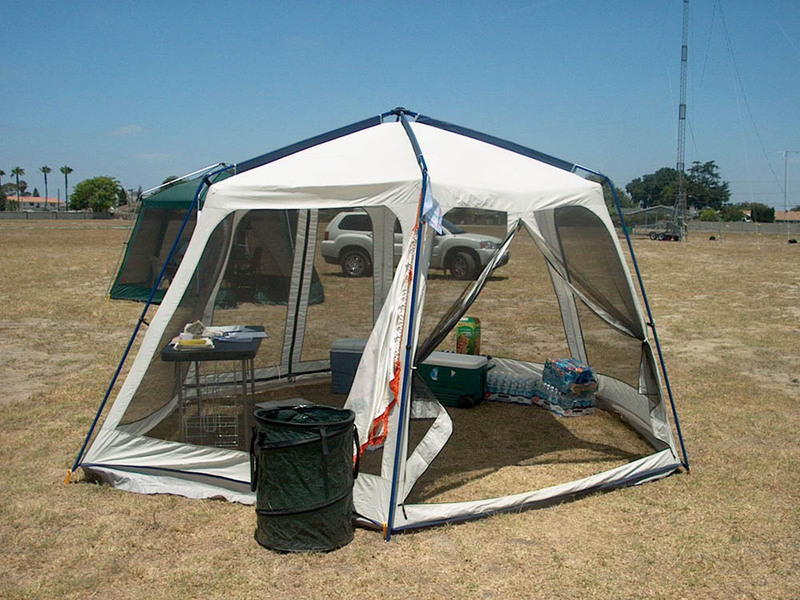 The motorhome of Rich-KE6WWK and Bev-KI6APH was outfitted with a sun-cloth shaded sitting room that was affectionally called the "OASIS" from the hot sun by resting hams and visitors. 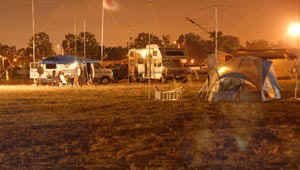 Here is a unique "night shot" of part of the OCARC Field Day camp under plenty of emergency lighting. The VHF/UHF/10M SSB tent is on the right hand side of the picture. In the early light of morning while the signal levels were still somewhat weak, Ken-W6HHC on 20M SSB heard a weak call from FOØL and made the contact. 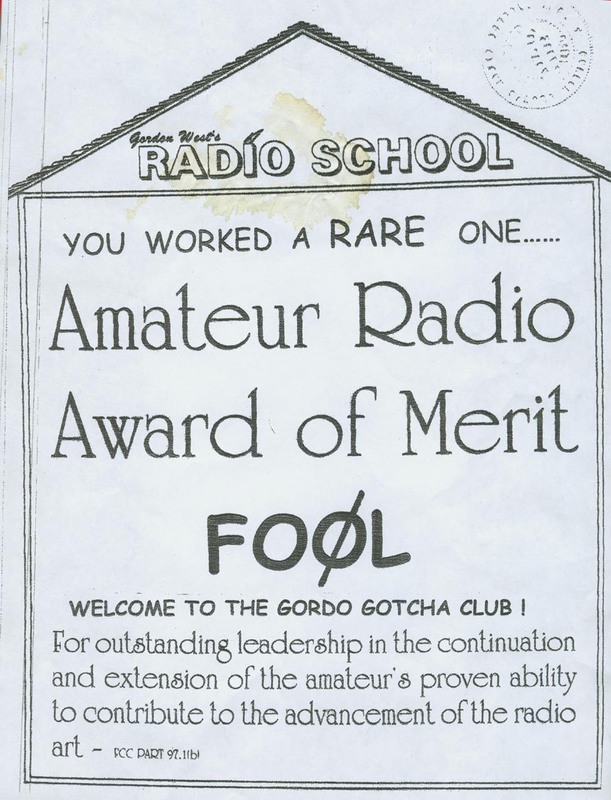 A short time later an "Award Delegation" arrived to present Ken with a "Gordo Gotcha Club Certificate". 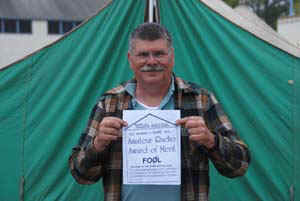 Ken admitted that he fell for the gag "....hook, line, and sinker". 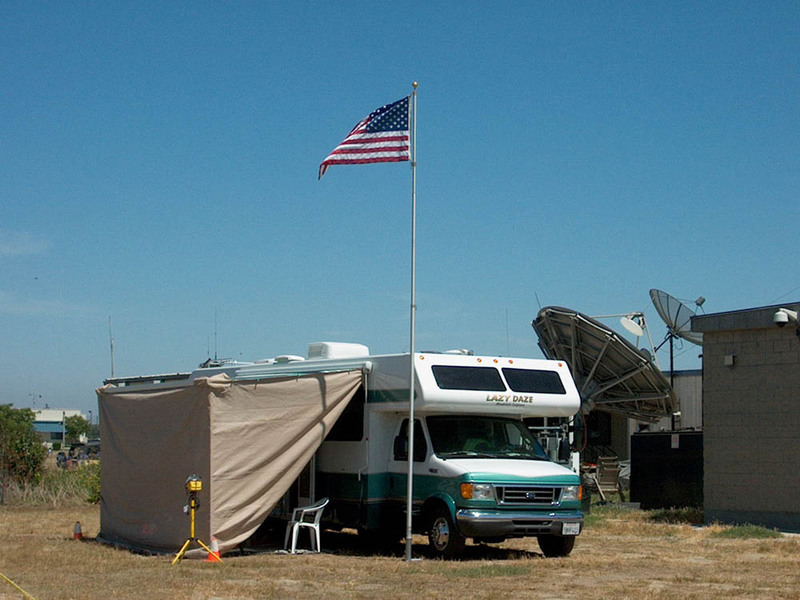 Each year Gordo-WB6NOA uses a nearby weak QRP rig to pretend that a supposedly "rare DX" station was calling. 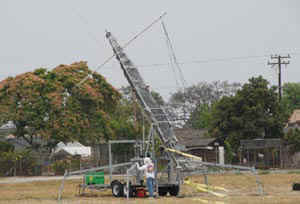 He is always able to "fool" a few ops. 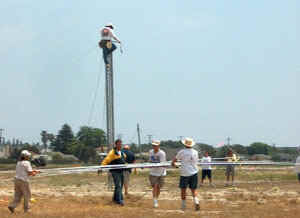 A team of workers begin lowering 15M SSB beam and tower after FD is over. 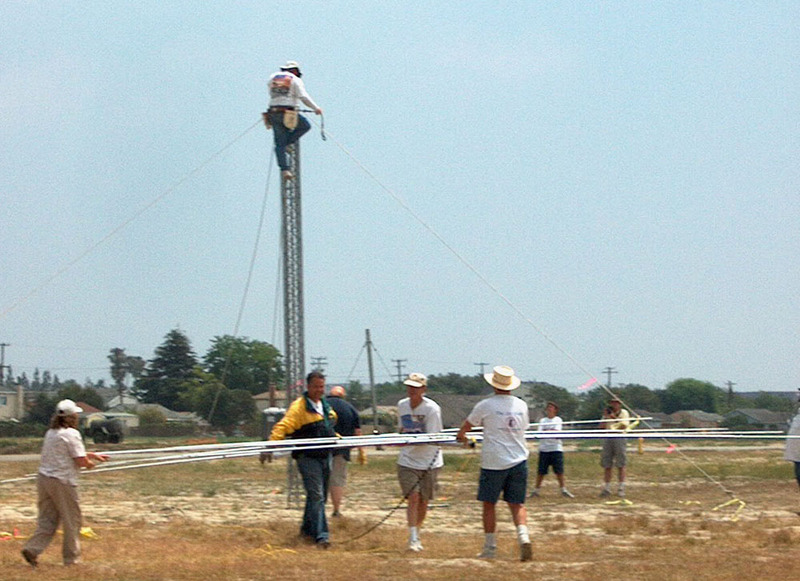 Dino-K6RIX climbed to the top of the tower and had just pulled the 5-ele beam off the tower to workers below, Carrying the beam a safe distance from the tower are (L-R) Cathy K6VC, John-WB6AJE, Steve-KI6DDE, and Dan-N6PEQ. 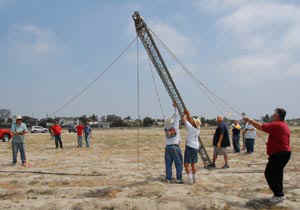 The next step is to lower the15M SSB tower. (L-R) Ken-W6HHC, (3 Boy Scouts watch in the distance), Dino-K6RIX, Dan-K6RIX, Willie-N8WP (holding down the base of tower), (in the background a group of four hams on the main guy ropes: John-WB6AJE, Steve-KI6DDE, Bob-AF6C, and Jim-N6DHZ), and Hank-W6HTW on the guiding rope on the far right. 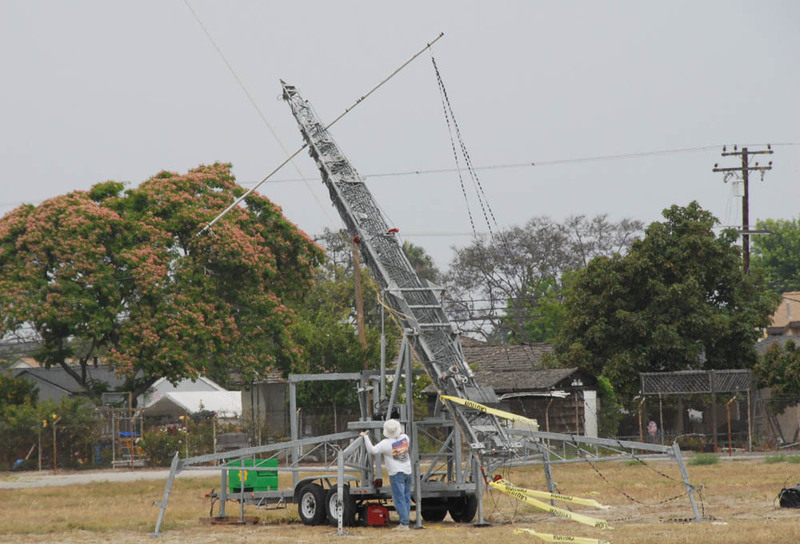 "...on to the next tower..."
Can you imagine that it only takes a one-man crew to lower the motorized huge 100 ft tower and then tilt it over onto its trailer?? 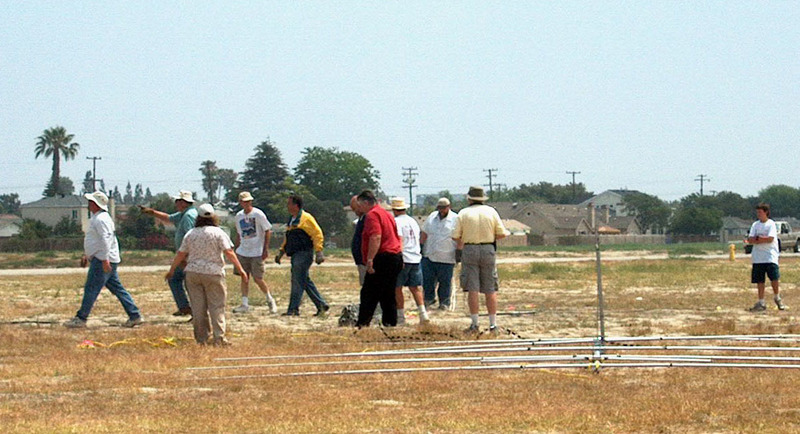 Dino-K6RIX was able to replace the entire 12-worker team in the photo to the right. Kneeling on the right side (L-R) Matt-KI6KHB, Robbie-KB6CJZ, Arnie-N6HC, Brian Putz - BSA Troop 788, and Howard-WB6TIK. (L-to-R): Ken-W6HHC, Gordo-WB6NOL, Suzy-N6GLF, Jim-N6DHZ (hidden in back), Roy - N6SLD (in camoflage hat), Shelley - KC6ZOW, ?? ?, Rich-KE6WWK, ?? ?, Bev-KI6APH, John-N6MU (in blue cap), ??? 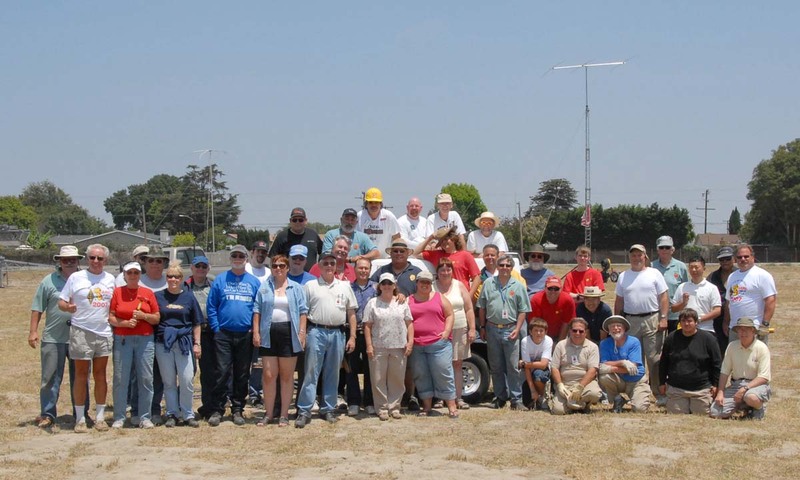 (black cap), Paul-W6GMU, Hank-W6HTW, Larry-K6YUI (black cap), ARRL SM Carl-WU6D, Chip-K7AA (yellow hard hat), Cathy-K6VC, Willie-N8WP (FD Chairperson), Dino-K6RIX (at top), OCARC President Kristin-K6PEQ, Steve-KI6DDE (on top with tan cap), Jordan Christopher - BSA Troop 788 Alumni (in brown hat), Cheryl-KG6KTT, Dan-N6PEQ (at top in white hat), John-WB6AJE, Bob-AF6C, Terry Brim BSA Troop 788 (in black hat), Brett - W6BAC Scoutmaster Troop 788 (in red cap), Daniel Brim - BSA Troop 788 Alumni, Ken-KI6DK (white hat), Bob-AA6PW (cap with neck shade), Bruce-KC6DLA, Katsutoshi-JK1PHL/AF6CQ, Frank-WF1A, and George-N6VNI.